Jerome Stakes Has Yet To Produce Kentucky Derby Winner: The Jerome Stakes was not always a Kentucky Derby prep race. The race has been run in months such as April and August. But since it’s move to January, in 2013, to kick off the Kentucky Derby trail in New York, the Jerome has produced one Kentucky Derby starter and no Kentucky Derby winner. However, before the Jerome was moved to January to be preparation for the Kentucky Derby, the race was a stepping stone for horses to become graded stakes winners. The 2015 edition is set to take place at Aqueduct on Saturday, January 3rd. There are some impressive horses in the 2015 Jerome Stakes starting gate, such as General Bellamy and Ostrolenka (pictured above), who did not fire last time out in the Remsen. Both of these horses should get the idea set up behind the speed (El Kabeir and Nasa) and be able to contend for the win late in the race. The Jerome Stakes was responsible for many great horses becoming Grade One winners. More recently, horses such as The Lumber Guy, Girolamo, and Tale of Ekati, have won the Grade Two Jerome Stakes while on their way to winning races such as the Vosburgh and the Cigar Mile. The Jerome has also seen many of its victors become winners of the Cigar Mile and becoming very skilled milers. Not many winners of the Jerome used the race as springboards to the Breeders’ Cup, but horses like Silver Train and Ogygian did just that. Ogygian would finish third in the Breeders’ Cup Sprint while Silver Train won the same race in 2005. Silver Train would go on to compete in 2006, winning the Grade one Met Mile as well. The Jerome has proved to be a good race for horses of lovely caliber and sprinter/miler pedigrees. Horses that have won the Jerome and proven to be high quality horses on and off the racetrack by winning races such as the Vosburgh, Cigar Mile, Met Mile, Carter, and the Frank J. De Francis Memorial Dash Stakes. Some may even venture to say that the Jerome has helped some stallions be successful as stallions, showing that they can pass on speed but also stamina that needs to be available for the Classics. While The Lumber Guy and Girolamo are too new to the stallion world, horses such as Silver Train, Discreet Cat, Richter Scale, Afleet, Ogygian, and Fit to Fight have all proven to be highly valuable stallions in the Thoroughbred industry. Silver Train had a short-lived stallion career, as he passed away from colic in Brazil on New Year’s Eve in 2013. 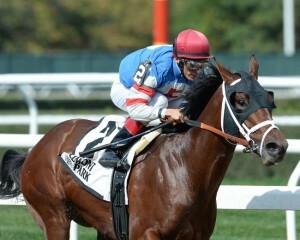 He did, however, sire J J’s Lucky Train, winner of the G3 Bay Shore Stakes. Discreet Cat has sired many versatile runners, such as sprinter Dads Caps, winner of the Carter Handicap, and Discreet Marq, winner of the G1 Del Mar Oaks. Afleet sired Northern Afleet, winner of multiple graded stakes, who also sired the Preakness and Belmont winner Afleet Alex. 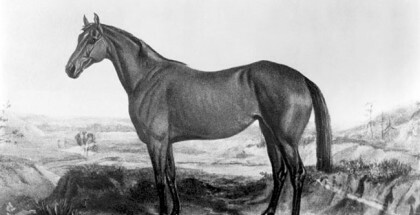 Ogygian never sired an equal to himself but did reproduce a well regarded stallion named Eishin Washington who stands in Japan. 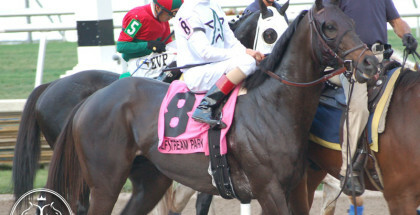 Fit to Fight was pensioned in 2005 from breeding, but was the stallion of Scrappy T, who caused Afleet Alex to stumble in the Preakness. This year’s edition of the Jerome may be actually better that is appears on paper. The class of the field is obviously the only graded stakes winner, El Kabeir. After winning the Kentucky Jockey Club Stakes at Churchill by the barest of margins, denying the closers on a bias track, El Kabeir is starting for his Kentucky Derby points early. Owned by Zayat Stables, who are no strangers to the Kentucky Derby, are seeking another horse that may be able to win them that coveted race. However, El Kabeir will have to fend of promising Pennsylvania-bred, Nasa, winner of two starts in four outings. There are also some impressive horses in the 2015 Jerome Stakes starting gate, such as General Bellamy and Ostrolenka, who did not fire last time out in the Remsen. Both of these horses should get the idea set up behind the speed (El Kabeir and Nasa) and be able to contender for the win late in the race. The Jerome field is strong and could there be another quality miler or sprinter in the field? Could the next influential future stallion be running this weekend in New York? Possibly!